Home > Stories > ACSD > The Regional Manager Is In! The Regional Manager Is In! I stopped by one of my favorite more conveniently located coffee shops the other day to meet some friends. As usual, the place was packed with early morning-ers in bad need of caffeine. And, per usual, there was a long line of patient, yet a little annoyed customers ready to bark out their special coffee drink request to a completely uninterested clerk. Oh…..sorry…..I meant CCRS……..Coffee Cash Receiver Specialist. When you are a CCRS, you can act annoyed with needy customers but a ‘clerk’ is a little farther down on the title scale. This day was a little lot different than all the other hurry-up-and-go days. because the CCRS was especially friendly—greeting customers with a smile and blurting out a loud “thank you” while delivering change with a broad smile. This morning was unlike most others because all the team members at the coffee shop were running around, making sure the milk and half and half jugs were full and fresh, the napkin dispenser was full, and, most surprisingly, all the messes left behind were cleaned up in quick fashion. 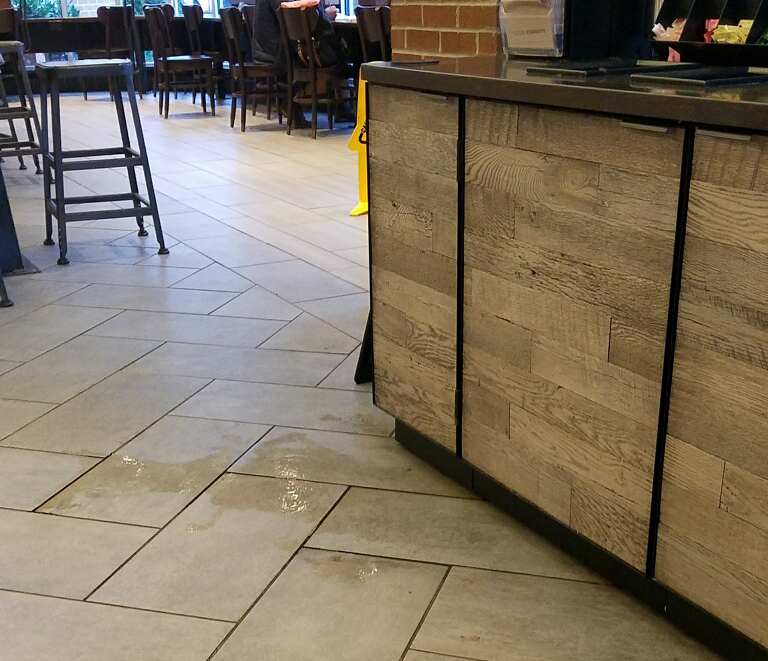 One of the employees even came from behind the counter to clean up a big spill. I was so shocked at the cleaning of the big spill I took this photo. All this courteous, caring, smiling, lickety-split behavior was unusual to say the least. All of this was much different from the usual indifferent handing over of change and the perturbed reaction to a ‘special’ order that was forever the norm. What had happened?? Did the ghosts of Christmas past and future visit all these people last night and scare the hell out of them like they did to Mr. Scrooge? Were they all put on notice if they didn’t change their ways and get more warm and fuzzy to customers? What had happened? What caused all these refreshing, uplifting changes? I soon found out. While grabbing a napkin, I overheard some of the coffee folks talking. One of them had just arrived and her cohort was telling him to get going and move fast because THE REGIONAL MANAGER IS IN!!!!! It didn’t matter if the floor was a sloppy mess any other day—-on this day the floor got cleaned because the regional manager was present. That’s why the milk and half and half didn’t stand empty until the fourth complaint. That’s why the CCRS was so nice and bubbly. The regional manager was in. Too bad all the coffee joint folks don’t realize the customers are more important than the regional manager. Too bad they aren’t as on-the-ball to please customers as much as they are jacked up when the regional manager is present. Maybe one day they’ll get it. Maybe one day they’ll take all that positive energy and deliver it to customers instead of managers. The manager signs the paycheck. The customers make the checks good!